My husband shows great concern for me when I travel alone. He explains the route to me repeatedly, ad nauseam. (I still get lost.) He reminds me to take an extra car key. He worries about me and checks on me often. I love it. As I prepared for a recent road trip to Oklahoma, I checked the weather forecast and decided to take an umbrella and a wind breaker. 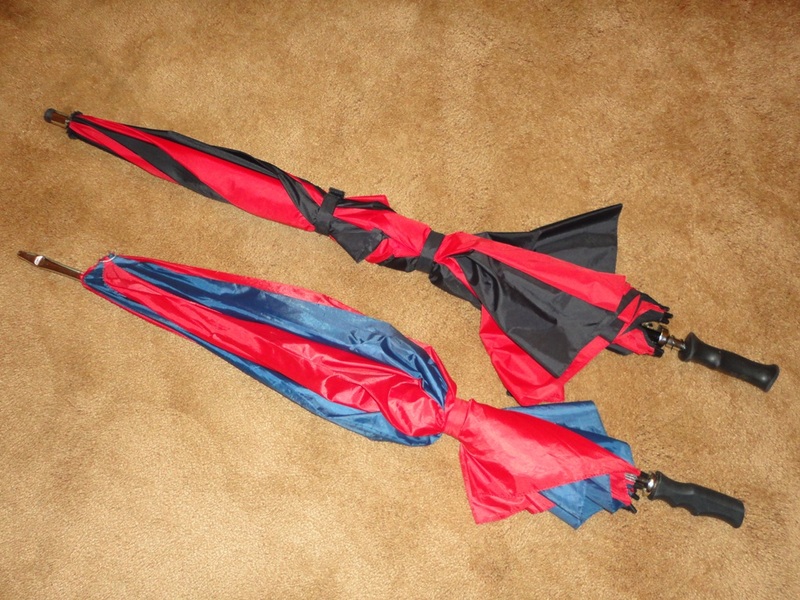 I packed my little fold-up umbrella in the front seat and found a full-size striped umbrella already in the trunk. When Dan asked, I told him I had my polka-dot portable and the blue and red striped one. It sprinkled off and on and I used my portable umbrella several times on the trip. When my sister and I made a trek into Tulsa, I felt smugly well-prepared when we both had to duck under my little rain shield. 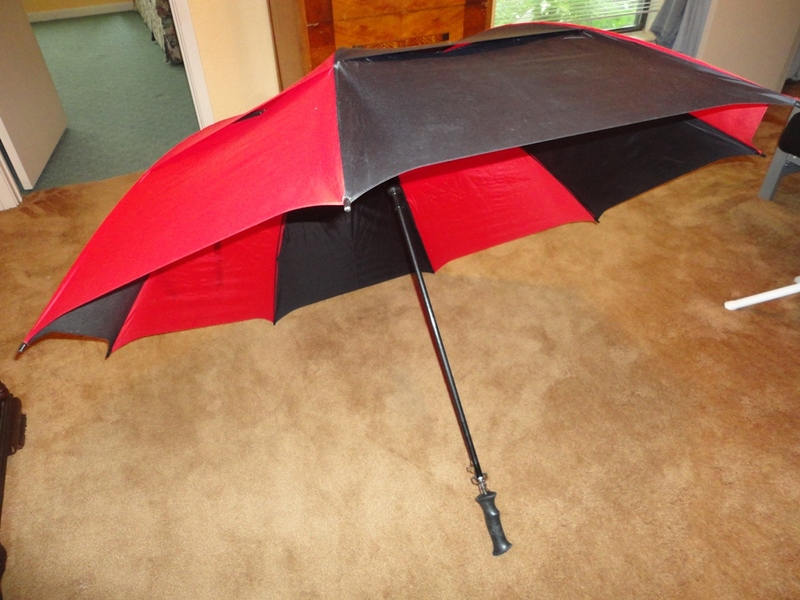 I let it dry in our hostess’s utility room and then, so I wouldn’t forget it, I carried the handy pocket-size umbrella to the bedroom and left it there. Then our cousin, Jack, came to greet us with a huge golfer’s umbrella. What a gentleman! I asked him to walk me to the trunk, opened it and took out my big back up protection. 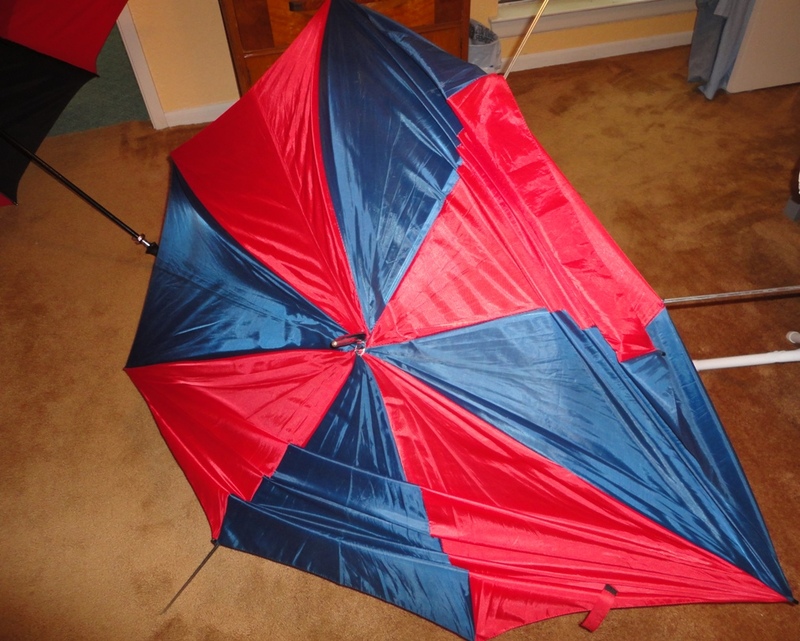 The wind was blowing, rain was pouring, driveway was standing in water and we were getting wet despite the overhead, so I hastily popped open the second umbrella. “Ka—whoosh!” the big nylon thing popped up…and kept on popping until it was inside out, ribs pointing at the sky. Some little clear plastic thingy went flying over our heads and onto the lawn as Jack and I went slack-jawed in amazement. Our cousin helped my sister out of the car and rushed her under the patio. I ran, holding one rib of my broken umbrella down the best I could, but I felt a stream of cold water down my back. Safe under the patio, I tried to figure out what had befallen the un-umbrella. At least four ribs had come unloose from the fabric. It would no longer close properly so I dumped it shamefully behind a potted palm. Indoors, the guests who had arrived before the deluge all wanted an introduction and a hug. I was wet: my hair was quickly becoming an explosive frizz (on one side only) and my leather sandals were soaked. After enduring all I could, I asked my cousin’s wife, Malinda, if I could please have a towel. If my curly hair had gotten wet all over, I might have come out okay. If all the guests had gotten as wet, I might have fit in. As it was, the sun came out and I’m the one in the group photos with the part frizz, part string hairdo and the half grin, half grimace expression. That evening I told my hubby all about it over the phone. “I knew that old umbrella wasn’t in the best of shape but you didn’t tell me it was broken!” He had no clue what I was talking about. I brought it home to illustrate before I threw it away. I already knew that no matter how much a person prepares, there are always unexpected circumstances. I’m going to personally check the function of umbrellas before I put my faith in them. Jack and Malinda are great at hosting a party. I also learned that even though I often make myself the martyr–the one who eats the burnt piece, sits on the wobbly chair, volunteers to get the umbrella out of the trunk–I’m not very good at it. This entry was posted in Short Takes on Life and tagged awkward moments, curly hair frizz, embarrassing mishaps, family reunions, martyr, preparedness, Why umbrella turns inside out. Bookmark the permalink.